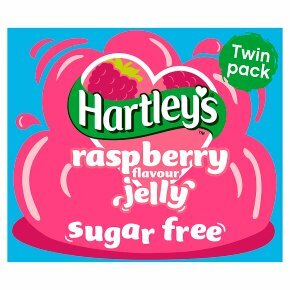 Raspberry flavour jelly crystals with sweeteners. Sugar free. Natural colours. Less than 40kJ/10kcal per portion. It's so easy to make! 1 Pour contents of 1 sachet into a jug/bowl. 2 Add 1/2 pint (285 ml) of boiling water and stir until dissolved. 3 Add 1/2 pint (285 ml) of cold water, stir then pour into mould/serving dish. 4 Allow to cool, then refrigerate to set. NB adding fresh pineapple, kiwi or papaya fruit will prevent jelly from setting.